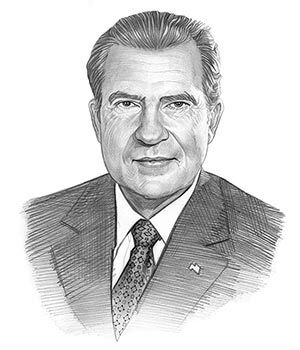 Summary of President Richard Nixon for Kids: "Tricky Dicky"
Summary: Richard Nixon (1913-1994), nicknamed the "Tricky Dicky", was the 37th American President and served in office from 1969-1974. The Presidency of Richard Nixon spanned the period in United States history that encompasses the events of the Cold War Era and the age of the Space Race and the Cold War Arms Race. President Richard Nixon represented the Republican political party which influenced the domestic and foreign policies of his presidency including his policy of "Vietnamization". The major accomplishments and the famous, main events that occurred during the time that Richard Nixon was president began in 1969 when Neil Armstrong became the first man to walk on the moon. 18-year-olds got the right to vote, the SALT Treaty was signed, Detente was established and the Vietnam War ended. The Pentagon Papers were leaked bringing concerns about the integrity of the government but they did not implicate the Nixon administration. Then the Watergate Scandal broke. The conspiracy and cover-up of the Watergate Break-in brought down Richard Nixon, who resigned before he could be impeached. Richard Nixon resigned from office and died due to a stroke on April 22, 1994, aged 81. The next president was Gerald Ford. The summary and fact file of Richard Nixon provides bitesize facts about his life. The nickname of President Richard Nixon provides an insight into how the man was viewed by the American public during his presidency. The meaning of the nickname "Tricky Dicky" originally referred to allegations of dirty tricks during the 1950 US Senate race in California. The "Tricky Dicky" nickname resurfaced following the conspiracy and cover-up of the Watergate Scandal. Summary of the Cold War: The Cold War (1945 - 1991) was a 'war of words' involving the Cold War Space Race and the Cold War Arms Race involving the nuclear build-up between the USA and the West and the Communist countries dominated by the USSR and China in the East. Richard Nixon was one of the nine US Presidents who were in office during the dangerous period in history known as the Cold War in which the US adopted the policy of Containment to restrict the spread of communism abroad. Summary of Stagflation: Stagflation was the term used to describe the state of the nation's economy during the 1970's and the Richard Nixon administration. Stagflation was a combination of economic stagnation, rising prices and inflation. President Richard Nixon failed to curb stagflation and the worst recession since the Great Depression continued into the presidencies of Gerald Ford and Jimmy Carter until the economy finally began to recover during the administration of Ronald Reagan. Summary of the Vietnam War: The Vietnam War (November 1, 1955 – April 30, 1975) between communist North Vietnam and the Viet Cong communist guerrillas (backed by China and the USSR) against the non-communist South Vietnam (supported by US military aid and involvement). There were four US presidents during the Vietnam War: Dwight D. Eisenhower, John F. Kennedy, Lyndon B. Johnson and Richard Nixon The first US combat troops were sent to Vietnam in March 1965 and left in August 1973. Summary: President Nixon authorized 'Operation Breakfast' (18 March 1969 until 26 May 1970), the secret bombing of Cambodia in an attempt to destroy supply routes. On April 30, 1970 President Nixon announced that he had extended the Vietnam War into Cambodia, requiring the need to draft 150,000 more U.S. soldiers into the war effort, that sparked protests across the nation that led to the Kent State Shooting. Summary of the Kent State Shooting: The Kent State Shooting occurred on May 4, 1970 when 4 students were shot dead at Kent State University by Ohio National Guardsmen during a protest against the escalation of the Vietnam War into Cambodia and the need to draft 150,000 more U.S. troops. Summary of Vietnamization: Vietnamization was the term used by Richard Nixon in a broadcast speech on November 3, 1969 to describe his aim at achieving “peace with honor” in the Vietnam War. Summary of the Pentagon Papers: The Pentagon Papers was the name given to a secret Department of Defense study of U.S. political and military involvement in Vietnam from 1945 to 1967. The Pentagon Papers leaked March 1971 revealing that the US government, in administrations prior to that of Richard Nixon, had been dishonest with the American public. Summary of the SALT Treaty: The Strategic Arms Limitation Talks (SALT) that began in November 1969 and ended in January 1972, resulted in the SALT Treaty between the United States and the Soviet Union. Summary of the End of the Vietnam War: The End of the Vietnam War (November 1, 1955 – April 30, 1975) officially ended on April 30, 1975 although direct U.S. military involvement ended on 15 August 1973. Summary of Earth Day: The first Earth Day was established following the disastrous 1969 Santa Barbara oil spill. It was organized by Gaylord Nelson and held on Wednesday, April 22, 1970 as a large-scale demonstration on behalf of the environment which came to be known as "Earth Day". Summary of the Clean Air Act: Richard Nixon signed the extension to the Clean Air Act in 1970 aimed at phasing out leaded gas by the mid-1980s, and the establishment of the Environmental Protection Agency (EPA) on July 9, 1970. Summary of Roe v Wade: The Supreme Court decision in Roe v Wade declared that all the individual state bans on abortion, during the first trimester, to be unconstitutional. The law allowed states to regulate, but not to ban, abortion during the second trimester and allowed states to ban abortion in all trimesters, unless abortion was in the best interest of the woman's physical or mental health. Summary of the of the Arab-Israeli Conflict: The 1973 Arab-Israeli Conflict, aka the Yom Kippur War, was fought from October 6 to October 25, 1973 by the coalition of Arab states led by Egypt and Syria (supported by USSR) against Israel (supported by USA). Summary of the Watergate Scandal: The conspiracy and cover-up of the Watergate Break-in led to the Watergate Scandal. President Richard Nixon and many of his aides were implicated in the web of lies and conspiracies and the Watergate Scandal culminated in the president's resignation on August 9, 1974. Richard Nixon resigned before he could be impeached. The article on the accomplishments of Richard Nixon provides an overview and summary of some of the most important events during his presidency. The following Richard Nixon video will give you additional important history, facts and dates about the foreign and domestic political events of his administration.